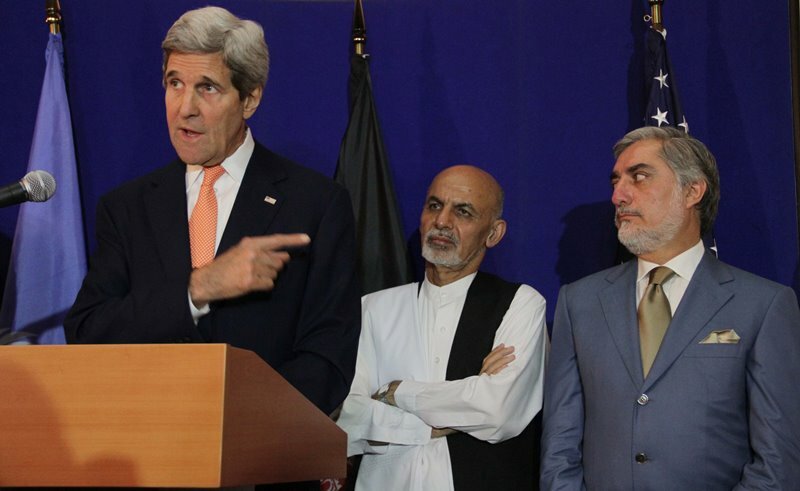 The so called National Unity Government of Ashraf Ghani and Abdullah Abdullah, established by former US Secretary of State John Kerry, completed its three years. In response to the favor John Kerry bestowed upon them, they within the first 48 hours blindly signed the Bilateral Security Agreement. After signing the security pact the US carried on with the policy of colonialism and occupation that literally turned Afghanistan into a US military base as well as its war project. To hold on to their rule, these fake leaders have been taking the burden of all the crimes committed by the U.S. and NATO forces on their shoulders. For instance, they took the responsibility of the U.S. drones strike on the MSF Hospital in Kunduz, which resulted in the killings of tens of doctors and patients, before the issuance of any official statement by occupying US. Few months ago, the vicious U.S. forces dropped its mother of all bombs on the Acheen district of Ningarhar province but again these traitor rulers gave the impression to the people as if it was dropped with the prior coordination and approval. Moreover, the so called National Unity Government also claimed the responsibility of bombardment on the Afghan National Army convoy in Logar province, the bombardment on the civilians in the Ningarhar province, and now the strike on the security forces in Greshk district of Helmand province. In an already fractured nation of like Afghanistan having such traitor rulers is what the U.S. and NATO could hope for. It is due to their shameless subservience and utter slavery that the US gave helicopters to the Afghan security forces to continue barbarity on their behalf and to put pressure on the armed apposition so that to force them to come to the negotiation table, as per the new Trump policy. To exempt the U.S. and its brutality the regime in Afghanistan is taking responsibility even for the crimes committed by the US and NATO forces, which is more worrisome than the bombardment of the occupying forces. It is worth mentioning here that according to the report published by the U.S. officials, only in August the U.S. have dropped over 2000 bombs in Afghanistan. In addition to all this, just over a month ago the U.S. forces dropped flyers, using helicopters in Parwan province, in which they portrayed themselves as lions and Taliban as dogs. Not only that they put the Kalima on the dog’s back, printed on the flyer. In these flyers they asked the people to liberate themselves from the “terrorist dogs” and to assist the coalition forces so that they finds these “terrorists” and eliminate them in order to make your lives and the lives of your family secure. They also asked people to inform them about the presence of the Taliban using the telephone number written on the flyers. Expectedly, the puppet government of John Kerry chose to stay dumb silent over such a serious matter related to the symbols of Islam, until the public came out on the roads, arranged huge protests and demonstrations. In order to defuse the situation, the dis-unity government issued a weak statement and called for an investigation, the result of which we will never see. Due to the policies of the John Kerry made government youth that is the asset of any state have been forced to flee the country. Not only that, the government has constantly been inciting sectarian, ethnic, and tribal hatred in all segments of the society. They have all been armed and are on the verge of fighting one another. Also, with the help of western embassies, Ashraf Ghani and his cronies have been aggressively carrying their polices of attacking the Muslim women, changing the educational curriculum, changing the remaining Islamic rules and laws through different projects that have led to vulgarity, obscenity, crimes, killings etc on a massive scale. The U.S. on the other hand is strengthening its bases under the pretext of war against ISIS and have announced its policy of using Afghanistan as a base for its strategy in South Asia. Hence, for the purpose of achieving its strategic goals in the region the U.S. announced Afghanistan as part of the South Asia project, which will push Afghanistan further into a battle ground of proxy wars among different regional players. To conclude, the failure of the subservient disunity government and the fact that the occupying forces are killing us, insulting our Deen, their war against Islam and Muslims under the guise of “terrorism and extremism”, and most importantly how the puppet government take responsibility of the crimes committed by the US and NATO forces should now be absolutely clear to everyone. In fact, these subservient and disgraced ruling elite have no courage to face the nation and to answer the issues and concerns. Hence, it’s utterly necessary for the Muslims and the Mujahid nation of Afghanistan to join hands with the rest of the Ummah to establish the Khilafah Rashidah (Caliphate) and to stand firm against the Kufr ideas in all its forms and manifestations, because it’s only the Khalifah that could defend the Ummah of Muhammad ﷺ, our Deen, our values, our honor, our resource and every drop of our blood. “Only the Imam is a shield, behind whom you fight and protect yourself”. Next PostThe Rulers of Iraq Are Angry Over a Flag Created by the English But The Crimes of America Against the Muslims Do Not Shake Them! !